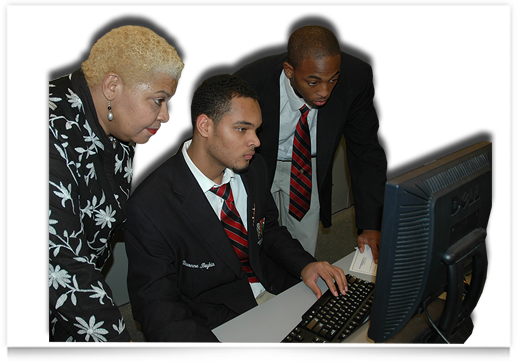 Applicants– The information collected by EDU, Inc., is done so for the sole purposes of providing that information to our EDU, Inc. Common Black College Application Member Institutions. Your information is not provided to a third party. Once collected, and you have submitted your EDU, Inc. Application, it is then made available to all EDU, Inc. Member Institutions. Passive Collection of Information–In addition to the information which you actively provide to EDU, Inc. by methods such as completing the EDU, Inc. Application, EDU, Inc. collects information about how you interact with our site. EDU, Inc. collects passive information for purposes such as testing and improving a user’s experience at the site and the compilation of broad aggregate demographic data and related usage information for internal purposes. The types of passive information collected by this site include, without limitation, your IP address, which type of browser you are using, where you go on our site, and how long you stay on any part of our site. Passive information does not identify you to EDU, Inc. by name, and EDU, Inc. does not link your IP address to your personally identifiable information. Collection of Information from Students–EDU, Inc. abides by federal law and the guidelines set up by the Federal Trade Commission regarding youth privacy. As such, EDU, Inc. will not knowingly collect any personal information from or allow the completion of the EDU, Inc. Application process by young people under the age of 13.. Contacting You by E-Mail–EDU, Inc. may use your contact information periodically in order to send you e-mails regarding the completion of your EDU, Inc. Application, transcripts and test score request, updates at the EDU, Inc. site, such as new EDU, Inc. opportunities and additional listings which may be of interest to you. The frequency of these messages will vary depending upon your profile, including the types of scholarships and other activities you have indicated an interest in. In addition, we may send you free informational newsletters or notices relating to topics which may be of special interest to you, including financial aid, admissions tips and scholarship opportunities. Finally, if you specifically provide EDU, Inc. with permission at the time you submit your EDU, Inc. Application, you may also receive emails from our Sponsors in reference to scholarship and job opportunities. Any information provided to you from our partners is done so by them providing EDU, Inc. with the content for approval and EDU, Inc. forwarding that content to you via email. You have the option to opt out of emails forwarded to you including content from our partners. Disclosure to Law Enforcement and Similar Disclosures–While EDU, Inc. strives to protect the personal information of our users, EDU, Inc. discloses information if legally required to do so, if requested to do so by a governmental entity, or if it believes in good faith that such action is necessary to: (a) conform to legal requirements or comply with legal process; (b) protect our rights or property or our affiliated companies; (c) prevent a crime or protect national security; or (d) protect the personal safety of users or the public. EDU, Inc. users are given the opportunity to “opt-out” of having their information used for purposes not directly related to our site. You may opt-out from receiving specified types of communications from EDU, Inc. by clicking here. EDU, Inc. will only communicate with you according to your instructions. If you have any questions relating to opting out, please contact us at apps@eduinconline.com, and we will try to answer your questions. EDU, Inc. has security measures in place to help protect against the loss, misuse and/or unauthorized alteration of the information under our control. You are the only user authorized to update your profile, unless you provide your password information to another party. EDU, Inc. helps protect personally identifiable information by utilizing both online and offline security methods, including firewalls, passwords and restricted physical access to the places where your information is stored. Our staff is trained to comply with our security procedures, and our security procedures are regularly reviewed and revised, if necessary, by the Privacy Team at EDU, Inc.. If you have any questions about security issues at our site, please send an e-mail to apps@eduinconline.com, and we will try to answer your questions. Once your EDU, Inc. Common Black College Application has been submitted, you can only update your personal information by contacting the Office of EDU, Inc. This is done so to protect against submitting multiple EDU, Inc. Applications to our Member Institutions.